At First Presbyterian we work hard to make sure that we include the youngest of our members in the full life of the church. Part of this is incorporating the children and youth of the church into our weekly worship services. Children are given the opportunity to participate in worship in many ways through out the church year. One such way is through music. Children can participate in worship through music by joining one of our youth or chimes choirs. 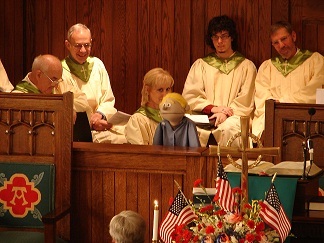 All of our children's choirs perform in worship on a regular basis. Children can also participate in worship through the children's sermon and by being a part of our Children's Worship program, where they will learn the basics of what worship is and the purpose that worship serves. Further, our children participate in worship by helping out with such special events as lighting the advent wreath at Christmas time and processing with Palms on Palm Sunday.